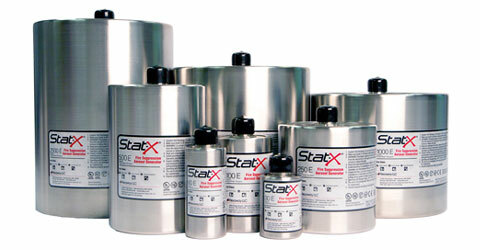 "Stat-X Fixed System Electrical Units are electrically actuated and range in size from units containing 30 grams (covering up to 0.5 m3) up to 2500 grams (covering up to 40 m3). These units are typically tied to conventional fire detection systems and releasing panel.​"
Significantly more effective than alternative extinguishing agents. Zero ozone depletion, zero atmospheric life, and insignificant global warming potential. Ease of installation — no pressure vessels, piping, or expensive installation manpower. Provides reliable, cost effective protection for a wide range of fire hazards. Listed for Class A, B, C fires by UL, ULC, CSIRO, ECB, and many others. Favorably reviewed by EPA for SNAP listing. Suitable for enclosed facilities and local applications. Safe for personnel — non-harmful to personnel at design application rates. Safe for valuable equipment — will not harm electronic equipment or magnetic media. Post fire cleanup is minimal — aerosol suspends in air for quick and easy venting after discharge. Compact — up to a 90% reduction in space and weight requirements.